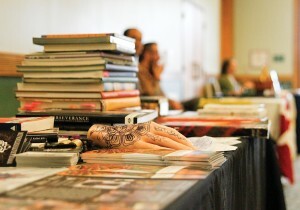 The Asian Arts and Culture Center brought tattoo culture to Towson’s campus with Tattoo Fest! April 15 to raise awareness for their exhibit “Perserverance: Japanese Tattoo Tradition in a Modern World” and explore tattoo art across the globe. The festival featured presentations by guest speakers who talked about tattoo culture in the United States, Japan and other places abroad. 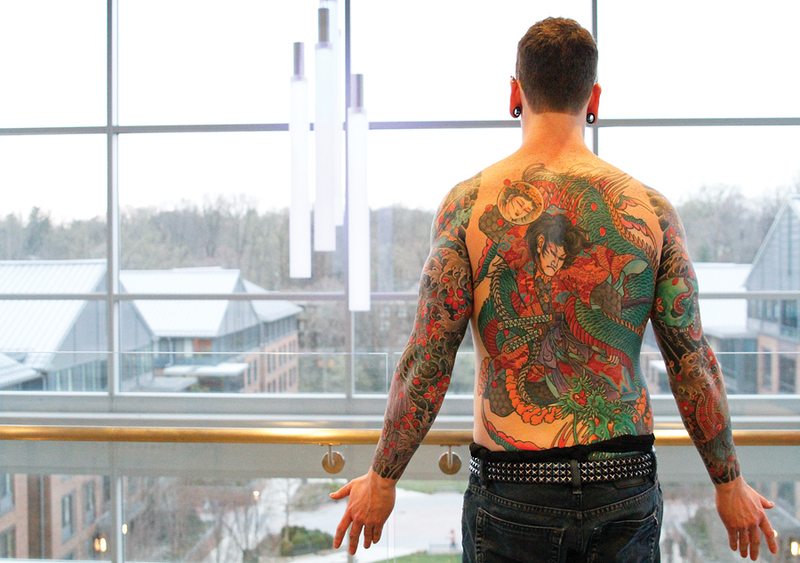 Josh Flemembaum, a client of the “Perseverance” tattoo artist Jakoh Horitaka, displayed his full body tattoos to the audience and spoke about the extensive process of being tattooed. Local tattoo artists like Imani Brown of Washington, DC, and artists from the Baltimore Tattoo Museum, were also in attendance to show off their artwork. Brown works primarily in the Kawaii art style and travels for work between Pinz-n-Needlez Tattoo in DC and TNS Tattoo in Osaka, Japan. Students from the Muslim Student Association (MSA) brought henna and small circular mirrors to the event to teach students about henna application. The South Asian Student Association (SASA) also brought henna and had their members design intricate patterns on the hands of other students. Bates also visited the “Perseverance” exhibit when it first opened in February for her ART 109 class, and said that she appreciates the artwork even more now that she attended Tattoo Fest. “I think [the Tattoo Fest] is really good, it brings another perspective to the Asian tattoo culture,” she said. In addition to the henna tattoos, students had the opportunity to receive airbrushed tattoos using a stencil. The Student Government Association (SGA) participated in the event by running the My Tattoo Photo Booth where those who attended could have their tattoos photographed. After, they were asked to share the story of their tattoo for the live Twitter feed for the event. Paglinauan said that these Tweets would later be archived on the Asian Arts and Culture Center website. Paglinauan said that through the festival, they hoped to get rid of some of the lasting stigmas surrounding tattoos and tattoo culture in both the United States and Japan.